In pitcher, mix all ingredients except orange wedges. Cover and refrigerate 20 minutes. Just before serving, stir and pour into 4 glasses garnished with orange wedges. 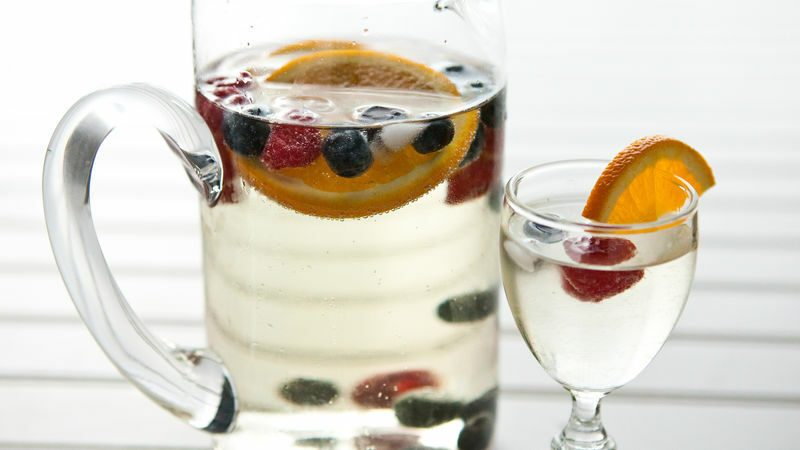 Different fruits can be used in this punch, like peaches and blackberries or strawberries and lemons. This punch is also delicious without the added simple syrup. It can be omitted if you want to save on calories. To make a simple syrup, combine equal parts granulated sugar and water. Bring to a boil. Sugar will dissolve. Refrigerate. Simple syrup is a bar tender's staple.